Reportedly good for goiter and other ailments, shells and shell meats are eaten in soups or suateed with vegetables. 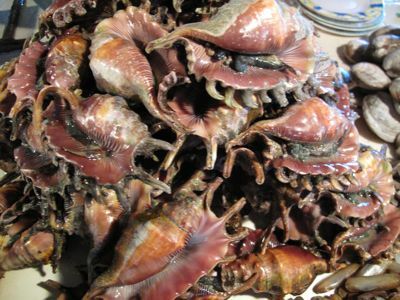 I haven’t eaten any of these type of shell meats, to my knowledge, and although I have eaten escargot and kuhol, I am not particularly fond of shell meats… I collected shells as a teenager, so maybe psychologically I am averse to eating them…who knows. Extremely high in uric acid, I gather, these would be off-limits for me anyway as I am prone to gout. 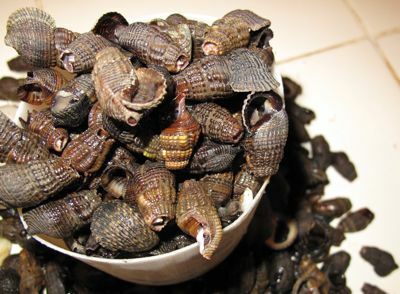 These shells, locally (in Tagbilaran, Bohol) known as saang, are also a delicacy. These ones are called dawdaw. Several other shells for sale, for which I did not write down their names. If you want to read more on shell meats, try this earlier posts here and here. MM. can’t exactly recall how we called these shells (the ones in the first photo) in Iloilo, but these shells are really good. Just put them over charcoal and they’re good to enjoy!! they look like razor clams. are they? if yes, they’re good sauteed with a lot of garlic and oyster sauce. Those “finger” shells looked so much like the bamboo shells we order at Mann Hann Chinese resto…sauteed in ginger and black bean sauce with hint to chili! Very good! They do look like razor clams. I agree with Mom-Friday. They look like the bamboo shells we eat at Tong Yang. i posted a comment earlier but i don’t see it. i think those are bamboo shells (or razor clams), and they’re very good grilled over charcoal briefly, or stir-fried with garlic, ginger and some salted black beans and cilantro or red peppers. the “saang” are sometimes sold here unshelled (coaxing them out of the shells is cumbersome), and they are very good in a gingery broth with malunggay, or cooked in coconut milk. 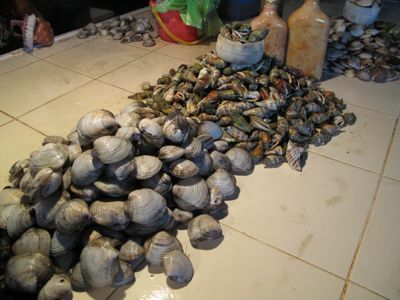 the ones in the foreground of the last photo are imbao, and they are considered “first-class”, are usually more expensive than most shellfish, and are very good broiled, baked or cooked in a clear or creamy (chowder) soup. MM, you’re missing a lot of goodness by not eating these babies! bamboo shells or tikhan to us Ilonngos–best cooked as a clear soup dish with ginger,onions and tomatoes.yummy! first photo does look like razor clams. we order this oftentimes cooked in black beans, garlic and some chilies. some places add crisped up ground pork. sarap!!! the last pix with the big clam (quahog?) we usually steam just until shell opens up. cut the meat into pieces, add minced onions, sili pang sinigang, rice vinegar, bird’s eye chili. really good with any grilled meats. almost like a salad, alis umay and make you eat more. Those datu’s digits are called tikan too in Tagalog. Folks usually serve them in broth with malungay or pepper leaves after being sautÃ©ed in garlic, onion and julienned ginger. They are slightly chewy and have a clean mild flavor. For the longest time, I could get them here packed in flat tins from Chile. Great as a quick substitute for vongole for fine spaghetti. no, Anton, diwal shells are very white and are bigger. 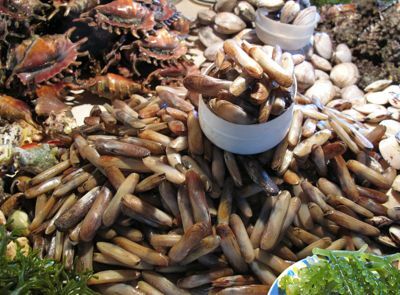 ï‚§	Scrub, de-beard, rinse and drain razor clams or mussels. ï‚§	Next, make the black bean and chilli sauce. Heat peanut oil in a wok until surface seems to shimmer slightly. Add ginger, garlic, chilli and black beans and stir-fry for 2 minutes. Add shao hsing wine and stir-fry for 30 seconds. Add sugar and allow to caramelise for 10 seconds. Add soy sauce, sesame oil and water and cook for 10 seconds. ï‚§	Lastly, add vinegar and spring onions and stir-fry for a further 30 seconds, then set aside. ï‚§	If using clams, place them in a shallow heatproof bowl that will fit inside a steamer basket. Place bowl inside steamer and position over a deep saucepan or wok of boiling water and steam, covered, for 3â€“4 minutes. Carefully remove clams and transfer to a serving platter. 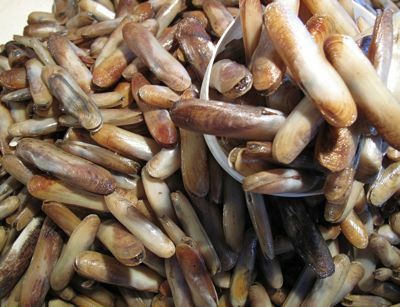 ï‚§	If using mussels, place them in a pot or a wok with 1Â½ cups cold water. Place over high heat, cover, and steam until shells open â€“ about 2 minutes. As the mussels begin to open, immediately remove from wok with tongs and place on a serving platter. ï‚§	Drizzle sauce over clams or mussels and serve. I haven’t seen this MANY shell fishes!! I think I’d go gaga when I see them!! I am such a fan of the Manila clams and the Bamboo Shells!! Pigafetta Cebu Opens This Weekend!